Is it ethical to treat a death row inmate only to stabilize him or her for eventual execution? What happens when a military provider receives highly sensitive intelligence from a client? How can clinicians refuse costly gifts from clients without damaging the therapeutic relationship? Should a therapist disclose a client's suicidal intent to the authorities? 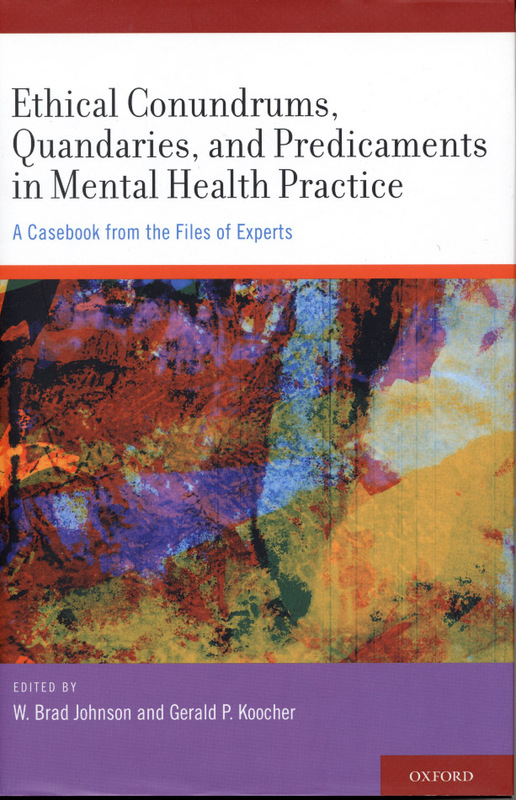 In Ethical Conundrums, Quandaries and Predicaments in Mental Health Practice , these and other real-life scenarios constitute a comprehensive and definitive ethics casebook for mental health professionals. Inspired by the many difficult situations they themselves have faced, an eminent group of accomplished mental health clinicians provide first-hand accounts of ethical problems that defy boilerplate solutions. Each chapter begins with a compelling and ethically complex case followed by an illustrative yet succinct analysis of the key ethical issues present and a personal reflection on the case itself, along with the process of ethical reasoning used to arrive at a final decision. Every case concludes with key recommendations for promoting ethical practice within an often challenging work setting. Highlighting the human aspect of ethics in mental health practice through the use of mesmerizing narratives while also provoking the reader to reflect upon what is the "right" thing to do, Ethical Conundrums, Quandaries and Predicaments in Mental Health Practice offers trainees and seasoned professionals alike invaluable informative models for dealing with ethical dilemmas, as well as the inspiration to confront seemingly insurmountable clinical problems. Does your young daughter talk endlessly about invisible friends, dragons in the basement, and monsters in the closet? Is your teenager about to start high school or being victimized by bullies? Is your son mortally afraid of certain insects or of injections at the doctor's office? 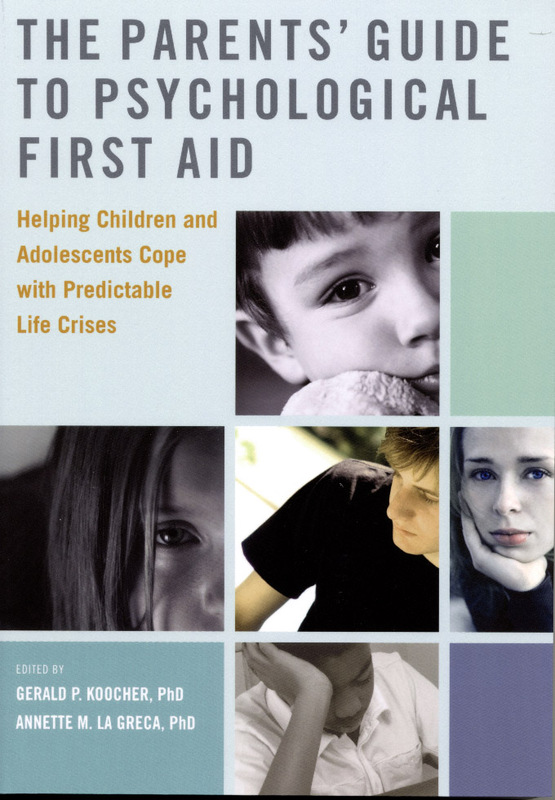 Compiled by two seasoned clinical psychologists, The Parents' Guide to Psychological First Aid brings together articles by recognized experts who provide you with the information you need to help your child navigate the many trying problems that typically afflict young people. Written in an engaging style, this book offers sage advice on a raft of everyday problems that have psychological solutions. The contributors cover such topics as body image and physical appearance; cigarettes, drugs, and alcohol; overeating and obesity; dental visits; the birth of a sibling and sibling rivalries; temper tantrums; fostering self-esteem; shyness and social anxiety; and much more. Each expert article provides an overview of the issues, offers reassurance for minor problems and strategies for crisis management, and discusses the red flags that indicate that professional help is needed. In addition, the book is organized into various categories to make it easier to find information. 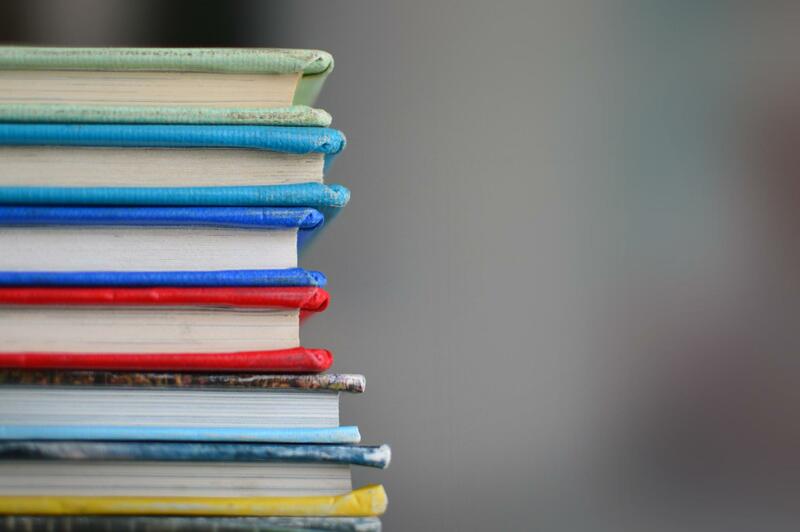 For instance, the "Family Issues" section includes articles on Blended Families, Divorce, and Traveling; the "Adolescent Issues" section covers such topics as Dating and Driving; and the "Social/Peer Issues" section explores such subjects as "Sportsmanship," "Homesickness," and "Making Friends." An encyclopedic reference for parents concerned with maintaining the mental health of their children, this indispensable volume will help you help your child to deal effectively with stress and pressure, to cope with everyday challenges, and to rebound from disappointments, mistakes, trauma, and adversity. All mental health and addiction practitioners want to provide their patients with the most effective treatment available. But with this brings the challenge of wading through an overwhelming amount of complex scientific research. 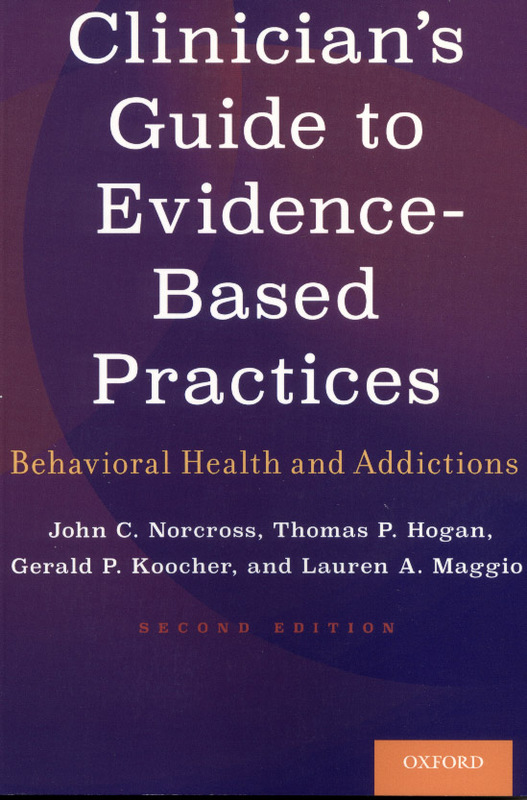 Here, a trio of distinguished scientist-practitioners provide a concise, practical, user-friendly guide designed to assist mental health and addiction practitioners in accessing, interpreting, and applying evidence-based practices (EBP). The Clinician's Guide is a manual that instructs on how to ask the right questions, how to access and appraise the best available research, how to translate that research into practice, how to integrate that research with clinician expertise and patient characteristics, how to evaluate the entire enterprise, how to attend to ethical considerations, and how to move the EBP movement forward by teaching it to others. No book covers EBPs in mental health research as concisely and accessibly as the Clinician's Guide . Although EBPs rely heavily on scientific research, this book is written for busy practitioners and students. Pocket-sized and paperback with reader-friendly graphics, summaries, and a glossary of essential terms, this book is designed for convenience and ease of use. An accompanying CD features expanded content, interactive examples, and hyperlinked references. The Clinician's Guide does not merely explain and discuss EBPs, but shows how to apply them to better serve patients. Containing numerous practical examples and three realistic and representative case vignettes, the Clinician's Guide illustrates the real-life application of EBPs. 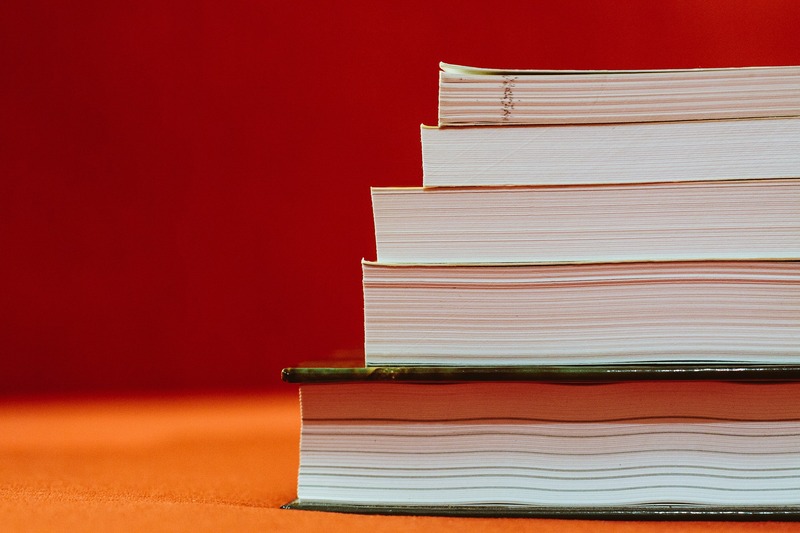 In addition to reviewing a broad spectrum of topics, methods of evaluation, and the application of specific tests, chapters also address forensic assessment matters such as ethical issues, professional liability, and cultural considerations. This comprehensive resource will be indispensable to mental health practitioners and legal professionals, and of great interest to researchers and students. We have designed some opportunities to earn continuing professional education credit on-line through ContinuingEdCourses.net. The course titles/topics appear below. Click on the course title to connect and view the course content. Here is the revised and expanded edition of the indispensable companion for every mental health practitioner. Improved over the first edition by input and feedback from clinicians and program directors, the Psychologists' Desk Reference, Second Edition presents an even larger variety of information required in daily practice in one easy-to-use resource. Covering the entire spectrum of practice issues--from diagnostic codes, practice guidelines, treatment principles, and report checklists, to insight and advice from today's most respected clinicians--this peerless reference gives fingertip access to the entire range of current knowledge. Intended for use by all mental health professionals, the Desk Reference covers assessment and diagnosis, testing and psychometrics, treatment and psychotherapy, ethical and legal issues, practice management and insurance, and professional resources. Chapters have been clearly written by master clinicians and include easy-to-read checklists and tables as well as helpful advice. 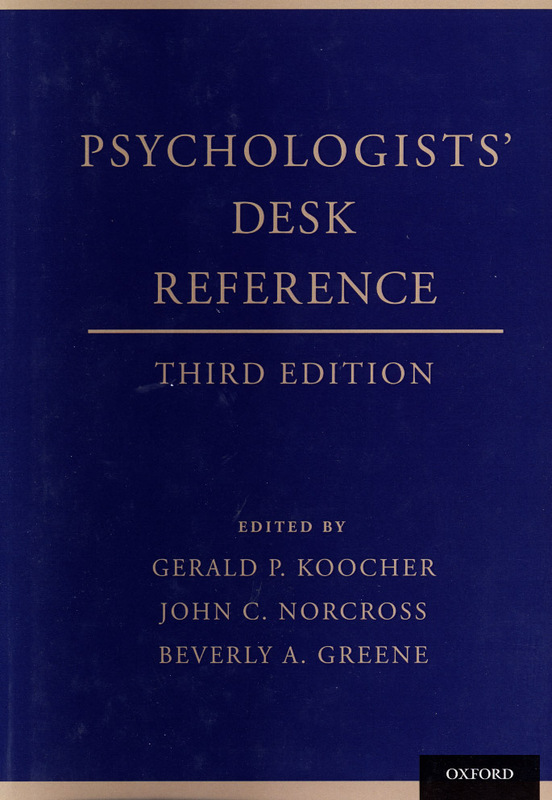 Filled with information psychologists use everyday, the Psychologists' Desk Reference, Second Edition will be the most important and widely used volume in the library of psychologists, social workers, and counselors everywhere. -Thoroughly revised chapters by the field's leaders. -29 entirely new chapters, now totaling 140. -Sections reorganized to be smaller and more specific, making topics easier to find. -A listing of valuable Internet sites in each chapter. -Increased emphasis on evidence-based practices. -A companion website containing graphics, illustrations, tables, primary resources, extensive bibliographies, links to related sites, and much more. The new 4th edition of Ethics in Psychology and the Mental Health Professions: Professional Standards and Cases is now available for orders. 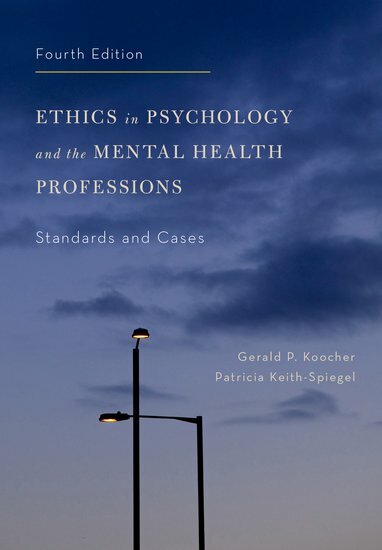 To see Dr. Keith-Spiegel's new book, Red Flags in Psychotherapy: Stories of Ethics Complaints and Resolutions click HERE.